When Hofstra takes on Kentucky Sunday, it won’t be at Nassau Coliseum, as organizers had hoped one year ago, but at Barclays Center. But though the event – which was moved to Brooklyn in May – would have ideally opened up the renovated Coliseum, a spokesperson for the arena said that they’re still on target for their April opening and will be hitting major milestones soon. Seat installation will begin in a couple of weeks, the spokesperson said, and the exterior is quickly taking shape. The Coliseum’s Twitter account showed a drop-ceiling grid installation in the event lobby level, and on Nov. 27, they were preparing to lay tile in the VIP lounge. They put in steel installation for a new elevator at the time and a drop ceiling grid on the concourse. 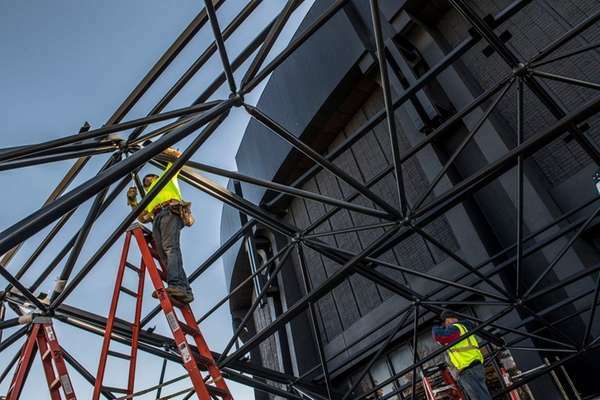 The 20-month, $261 million renovation on the recently renamed venue (it’s officially Nassau Veterans Memorial Coliseum presented by New York Community Bank) will culminate on April 5, with a Billy Joel concert.